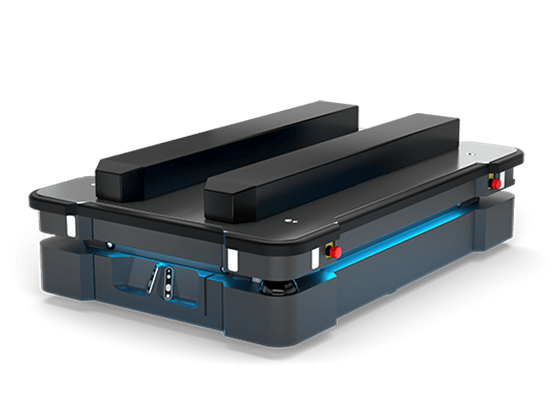 MiR500: Safe and Efficient Maneuvering of Pallets and Heavy Loads - Allied Automation, Inc.
MiR500 is designed to automate the transportation of pallets and heavy loads across industries. With a payload of 500 kg, speed up to 2 m/sec and a footprint of 1350×920 mm, MiR500 is the largest, most powerful, fastest and robust collaborative, autonomous mobile robot from MiR. The collaborative MIR500 safely maneuvers around people and physical obstacles. With its advanced technology and sophisticated software, the robot autonomously navigates to find the most efficient path to its destination. When it meets obstacles, it will automatically re-route to avoid costly lags in logistics processes. MiR500 is equipped with the latest laser-scanning technology that delivers a 360-degree visual for optimal safety. 3D cameras have a range of 30-2,000 mm above floor level to detect pallets. MiR500 is compliant with ISO/EN 13849 and fulfills the EMC requirement for industrial and light industrial use. The rugged MiR500 is designed for industry use with robust exterior that can withstand dropped cargo and can easily navigate up and down ramps and even through shallow water puddles. Call us at 800-214-0322 for more information about our MiR Solutions.